Over the last year, RU Sirius and Jeff Diehl have been hosting the amazing RU Sirius Show, a weekly podcast that launched in June 2005 as part of The MondoGlobo Network. It’s featured a stunning line-up of guests, discussing intriguing topics and cultural phenomenon. 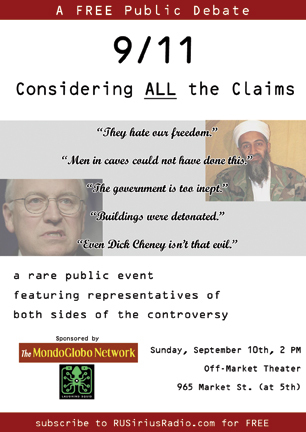 This Sunday, September 10th, they will be producing their first ever live show, in the form of a public debate: “9/11: Considering All the Claims”. The show starts at 2PM and takes place at the Off-Market Theater in San Francisco. Admission is free. The producers of The RU Sirius Show bring you 9/11: Considering All the Claims. During this rare, FREE public presentation, you will be able to examine all the issues at one event on Sunday, September 10th, 2006. The backers of the â€œshadow governmentâ€ camp have many issues that they believe were not addressed by the authorities in investigating the attacks; the backers of the â€œBin Laden-did-itâ€ camp have questions of their own. Both sides have accused the other of perpetrating wild conspiracy theories and hoaxes upon the public, so we thought weâ€™d provide an open examination and critique of the major points, especially given recent polls that show 42% of Americans suspect the government had a hand in causing the destruction of the Twin Towers. Joel Schalit, a Managing Editor for Tikkun Magazine, will be representing those who are skeptical about the â€œconspiracy theories.â€ Fred Burks, who served as a foreign language interpreter for top officials in many countries, including Presidents Clinton and George W. Bush, will be representing the â€œpro-conspiracyâ€ view. RU Sirius will host the panel along with RU Sirius Show co-host Jeff Diehl. Laughing Squid is proud to be a sponsor of the RU Sirius Show’s inaugural foray in to the wilds of live podcasting. If you are in San Francisco, try to make it down to the show or else you can always just tune-in online.